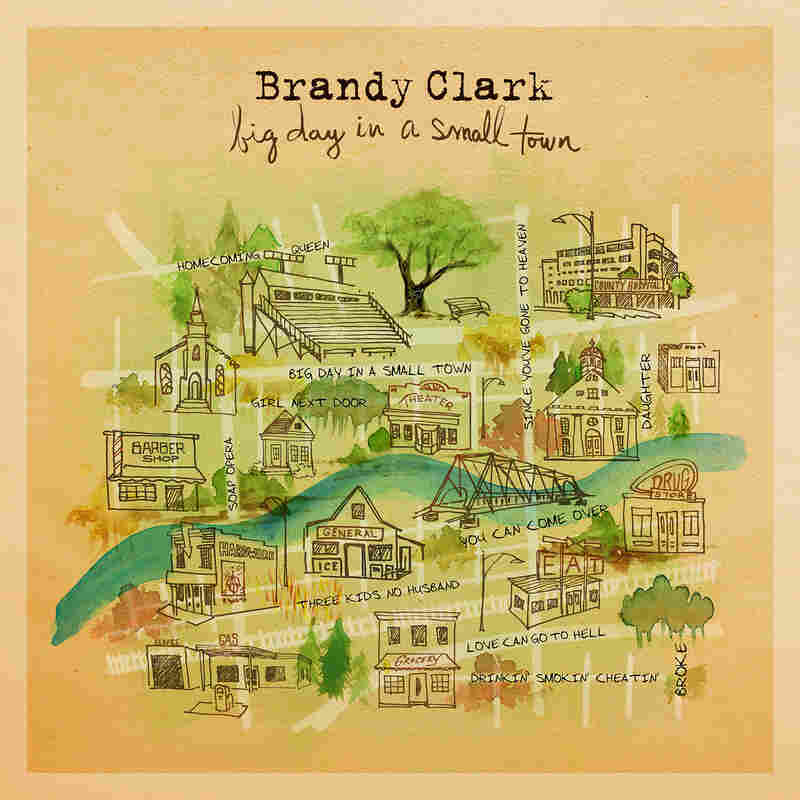 Review: Brandy Clark, 'Big Day In A Small Town' The country singer-songwriter's second album boasts a big sound. But it keeps beautiful details intact, as Clark speaks for those often pushed aside within traditional storytelling narratives. Five short words add up to one of the most tantalizing, trouble-making phrases in the English language: "I shouldn't say this, but..." That qualifier stands at the gateway to gossip, confession and necessary truths, banishing polite talk in favor of getting somewhere. Brandy Clark's songs often turn on the phrase, examining what happens right after it falls from the mouth of an ordinary person. It can set up a joke or wreck a marriage. It can even free a mind. Clark, one of Nashville's most valued songwriters, doesn't seek out what's hard to say in order to stage rock-star transgressions. Instead, she focuses on more intimate challenges people face and risks they take; ones that take place in private, or even in the silence of self-examination. Throughout her second studio album Big Day In A Small Town -- the bigger-sounding but still beautifully detailed follow-up to her 2013 solo debut, 12 Stories -- Clark speaks for those often pushed aside within the narratives that dominate the American scene: rural people, beauty queens who've lost their youthful shine, single moms muddling through their two-shift days. With humor, compassion and an ear for small signals of desire, Clark seeks out the turning points and the dead ends in her characters' lives as they move through hardship, fighting for happiness and the right to stop holding their tongues. The album's opening track sets the stage for these conversations. A choir of scattered voices leads into "Soap Opera," a wry overview of the semi-private spaces — hair salons, bars — where customers spill their guts to wage workers who temporarily become intimates. "Sherry shampooed 'til she got her own chair / Now she's playing shrink to every head of hair," Clark begins in her big, lovely alto, shining up her story with a dollop of class consciousness, the quiet critique that runs through her heartland rhetoric. "Soap Opera" plays on the way reality-show-fixated Americans imbue the days of their lives with excitement, but it climaxes on a kind note typical of this songwriter. "Ain't we all the stars in our own soap opera?" she asks in a chorus that Reba McEntire would surely admire. In Clark's songs, the hierarchies that would place anyone's drama above another's are gently displaced, and women's perspectives ring especially true. Clark's heart belongs to the imperfect people who still long for a little respect. The country dwellers in "Broke" deal with deprivation by growing their own (still illegal in most states) herbal relief. The betrayed monogamist in "Drinkin' Smokin' Cheatin'" may not have the courage to go rogue herself, but she's proud of her dreams. Clark sounds a bit like Patsy Cline in that honky-tonk tune; elsewhere, she uncovers bluesier bravado. "If you want the girl next door, go next door," she snarls in "Girl Next Door," a barnstormer that shows how producer Jay Joyce, known for collapsing the space between rock and country, had pushed this troubadour beyond her comfort zone. Big Day's swaggering uptempo numbers are complemented by the kind of calm exposition that made 12 Stories a favorite among songcraft connoisseurs. Nobody else right now is writing weepers like Clark, whose gift for modulating emotion is so fine-tuned, she makes every listener feel like she's holding their hand. The bereavement ballad "Since You've Gone To Heaven" is one of her finest, an account of personal loss (inspired by her father's death in a 2001 logging accident) that subtly and surely broadens to take on the wider sense of economic and cultural extinction felt by so many 21st-century residents of small American towns. Clark, who grew up in the bucolic town of Morton, Washington — motto: "Breathe Easy In The Mountains" — is often viewed as a country traditionalist. But she's not much interested in adopting a vintage veneer. Instead, she and her collaborators (she works with a tight community of Nashville songwriters, including her longtime writing partner Shane McAnally) spin out tales that could be inThe New Yorker if they weren't in song, enriching a country mainstream that could always use more wit and emotional honesty. Clark can talk back to bad boys and stand up for sassy girls as well as any woman in boots. But she goes deeper, simply by paying careful attention; by making note of the more nuanced emotions that run through the low-grade confusion of ordinary life. "Heaven knows I only wish you well," Clark sings in the voice of someone who's broken, yet still determined to be her best self. "But love? Love can go to hell." She shouldn't say such things. Yet who among us hasn't felt them?